My latest exhibition at the Devon Guild of Craftsmen is of my monotypes and references me as an artist and gardener. My first gardening memories are of helping my grandfather water his garden. He grew beautiful phlox and had borders neatly lined with thrift, and dug weeds out of his lawn by hand. My parents gave me a section of garden and I spent hours tending the plants and transplanting them fascinated by the juxtaposition of colours and forms in nature. I created order and pattern in my planting where nature sought disorder. From an early age favourites developed: the happy faces of violas and pansies, the delicacy of snowdrops, the brilliance of poppies, the enormous scale of hollyhocks and sunflowers. I grew annuals from seed and learnt how to propagate from cuttings. Visiting great and famous gardens is always a joy, a source of ideas and inspiration for my own garden. Visiting national galleries and special exhibitions is equally imperative for inspiration for my art work. The Royal Academy’s curators of the exhibition “Painting the Modern Garden, Monet to Matisse” selected artists who were keen gardeners and this helped form my ideas for this exhibition. 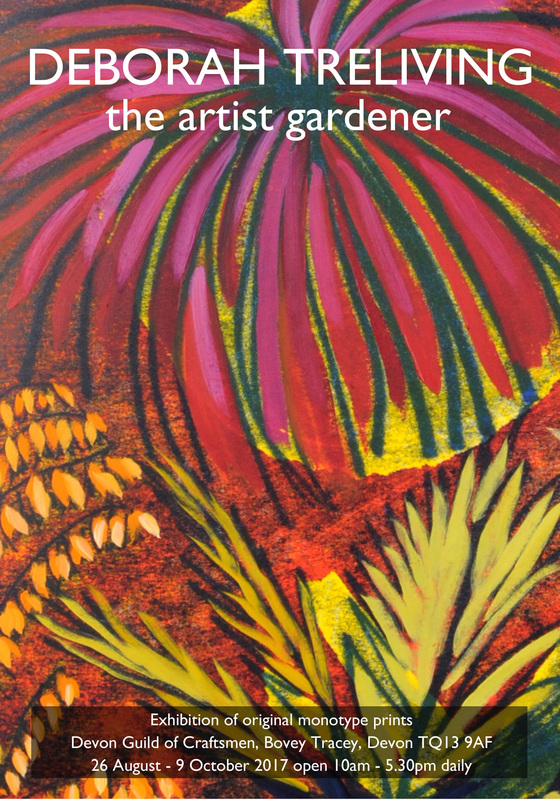 My passion for gardens and gardening runs parallel with my passion for painting and printing, for colour and texture. The prints in this exhibition are monotypes, developed from studies in my sketchbooks of grand gardens and developed into my own secret garden. The freedom allowed in the monotype technique gives scope for freehand drawing and was a process used by Degas in his drawings of ballet dancers, which he worked upon with pastel. Many of my monotypes have 3 or 4 printed colours in oil based printing ink and some have added hand colouring with pastel or oil paint. They are printed by hand using a Japanese baren on Fabriano paper.